Well, just started my X-mas knitting yesterday by casting on a sock in Sock Hop Satisfaction. I had originally got this yarn back in May, by getting a friend to camp on the website, since I was camping that weekend the yarn was on sale. I had 3 colors in mind, this is what he managed to get. I'm doing a plain stockinette, since the yarn provides pattern enough on its own. I originally tried 72 stitches, but 64 seems to be working better; I'll know in another inch or two when I can try it on past the ball of my foot. I'm doing toe up, since I prefer that method with special yarns, so I can use them up. Although from what I've seen on January One, 1 skein will get me nearly a knee-high, so if I end up with enough left over, I'll either use it as part of a second pair, or will see if I can get anklets or something from it. Using 2 mm needles that I got as part of a sock needle set down at Windsor Buttons in Boston while I was there for the first week of October. Finally have a finished object. I finished the shawl about a week ago, blocked it out on a spare mattress I have, twin size, and it probably could have been stretched another couple inches in width. 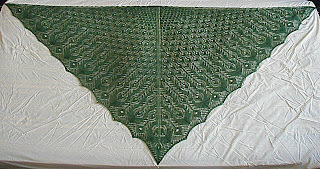 So yeah, once again, it's Fiddlesticks Peacock Feathers shawl, in Jaggerspun Zephyr, color Basil. Knit on 3.25 mm needles. I've been thinking since about halfway done, and still am, of doing a second one already, for mom this time, with the loops on the edges, not sure what color yet though. :D It was a fun knit for my first lace project ever!! Well, go figure... was searching for knitting needles, and found the bloody pattern for my shawl (in profile picture). Was sitting on top of my basket under a bag of stuff. While I facepalm, since that was a result of my 'cleaning' a few weeks ago, I'm very happy to have found it again. Just waiting for work to download, then back at that for the day.... and a friend in Ohio wants to commission me for kilt hose for him, soon as he gets his tax return in another week or two. So I'm hoping to spend part of tomorrow fondling yarns so I can choose one :) He wants it simple, but I'm gonna throw in a couple cables or braids for my own sanity, so I don't get bored from nothing but knit stitches like the last kneehighs I did. I'm also thinking of asking to get those back, and possibly frogging those and redoing them. My brain can't seem to wrap around the fact that socks need to be made *smaller* so that they stretch around the foot. So I'd likely subtract at least a good inch, maybe 1.5, from the circumference of her socks all the way down. Here's finally a picture of the two sets of socks I'm working on. The upper sock is Dicentra Designs colorway Kingsfoil knit on 2 mm needles, and the lower sock is Opal Handpainted #21 (half price at the LYS when I was there) on 2.25 mm needles. Since that picture, however, I decided that since I only have one skein of either yarn, I frogged the upper sock, and plan to frog the bottom one, and do toe-up socks, so I can match the length of the socks and use up the whole skeins, or close to it. 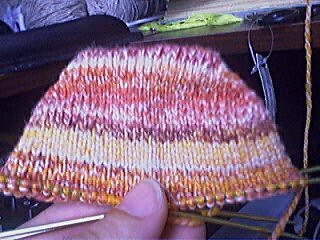 I've gotten the first Dicentra sock toe started, about 4-6 rows from starting the foot. The Opal will get going eventually, although I think I'm going to wait and do those on 2 mm as well, as I feel the 2.25mm isn't making as thick a fabric as I would like. 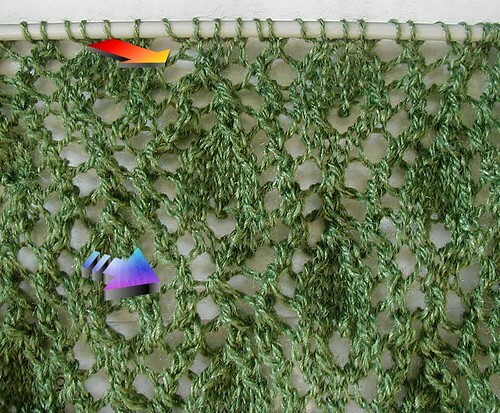 I also want the 2.25 needles for the Kroy Socks yarn I have, so I can try Knitty's Falling Leaves socks. The yarn is Muslin at the moment, but I'll be dying them some shade of green after the socks are knit. On the Peacock Feathers front, I've gotten to row 92, I believe, in the third or fourth chart. I'm not sure, because I can't find the pattern! I went to PEI with a couple friends a few weeks ago, and took the pattern and shawl with me to show friends, but after I got home, I remember dumping a bunch of stuff in one spot. Then when I went to look for the pattern and shawl a few days ago, I found the shawl and needles no problem, but the pattern is missing. I've yet to do an exhaustive search, but am emailing the lady who's place we stayed at, to see if I may have forgotten it there. Anyways, there's a picture I got of it before that trip, at my friend's again, stretched out to see half the pattern. I have at least 4 YO mistakes in there, where I've forgotten to YO, then fudged it on the next row, but they're thankfully not that visible. I just hope I find the pattern so I can keep going on this, as I was having fun with it, and still want to do at least one more in a different color. I've yet to decide which color. Well, I finally spun up that 30/70 silk/merino into approx. 215 yards of laceweight 2-ply goodness. It's a pinky grey, which I normally don't like, but it's all MINE!! After looking at several patterns and trying out a few, I've decided on Knitty's Branching Out, and am knitting it with 3 repeats on 2.75 mm needles. I'm only halfway through the first repeat, but it looks like it will come out well. One thing I've noticed, though, about my spinning is I really tend to overspin. The first ply of this definitely has more twist than the second ply, and so the yarn is a bit stiffer than I would have liked. Good thing is, though, that I have lots of the original 100g left (the ball of 2-ply is 23g). So I can play with making a second ball of laceweight. I also want to try other colorways from Ashland Bay. :) Or maybe from ebay, where I've also found several colorways in the 30/70 I want to try, soon as I get some cash. I'll update with pictures hopefully Tuesday, as Mondays are when I get to my friend's place with her camera. I got the socks finished and washed, and they were almost dry when I gave them to her. Forgot that wool takes a long time to dry, apparently, cause I haven't used it much before now. She loves them, although they're a touch big. She's gonna try throwing em in the washer and dryer to shrink em a bit. I hope it works. I must have had my gauge off a quarter stitch or so. But, to cheer myself up, I picked up the pattern for the Peacock Feathers shawl today right after work, and started it at SCA fight practice tonight!! I'm so excited to be starting my very first lace project. I've never done YOs or read charts before, so that's been quite interesting. My biggest problem will be to remember not to expect much in the way of looks until it's blocked. I know it'll look like crap til then, but my brain keeps expecting to see something. I'm at row 15 so far, and hope to get to 29 or so tonight, or halfway up Chart 1. I'm off work tomorrow, so I should get lots done over the weekend. I also am doing Fetching in Bernat Satin, and found out you can get 3 gloves from 1 ball, so I'll buy another ball of blue tomorrow, probably, so I can finish this pair and have enough for a future pair. Maybe a Mother's Day gift? I also bought some Opal handpainted (color 21) at the LYS; it's on half price, and there were 5 or so skeins, but I just bought one, as my budget's tight this month because of not working for a whole week so far. 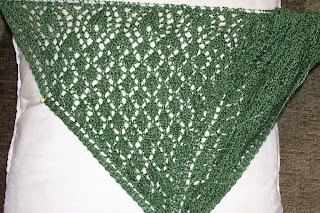 But this shawl will keep my interest for some time, I know, so I will try my best not to buy anything else til March. I'm obviously not too good at keeping this updated, eh? I'm making kneehigh piggy-toe socks for my friend's birthday. I started them once I got her measurements on Xmas eve, and am about halfway down the gussets of the second sock. I got a lot of knitting done today. I stopped the first sock a little short of the toe section, as I want to make sure I get the toes the same, as I've never done separate toes before. I'm knitting these in Kroy Socks - Paint Box on 2.5 and 2.25 mm needles. I'm hoping to get to the same spot as the first sock tonight, then work on the toes tomorrow. I hope to hand these to her Thursday night, as I'm unable to make her party this weekend. Her birthday's the 12th. After that, I got a few projects lined up. I got my Dicentra yarn in Kingsfoil from Crown Mountain Farms last Friday, and bought a set of 5 Pony 2 mm needles today, and am on the second row of ribbing to try grumperina's Jaywalkers. 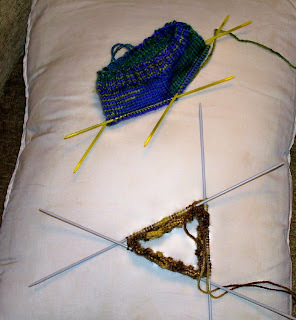 I'm trying for the larger size, given the smaller needles. I'm not sure if this yarn will work in that pattern, but I'll frog it if necessary. I also bought yarn today for the Peacock Feathers shawl, which will be my first foray into lace. Might as well jump in deep. I bought 2 balls of Zephyr in Basil; after I got back home, I realized there was a color called Peacock, but I don't think the store had it, as there was only a smallish basket of the Zephyr. I must see if she'll order in some for me. The store is Tangled Skeins in Dartmouth, and I've only been going there the last 3 weeks or so, but I hope to build a rapport there with the 'regulars' as it were. I'm on the shy side, but I'd really like to become part of the knitting community around here. Well, back to these gussets. I hope to get pictures of the finished socks Thursday evening when I present them. Well, I signed up for the 100 Miles by April 1 challenge, which I needed as a kick in the rear, as I've been neglecting my walking for the last 3 months or so. I went for my first walk today, and one of my regular routes is 1.46 miles, so that's what I did today to warm up. After a week or two, depending on weather, I hope to get up to the 1.8-ish mile route. I figure if I walk every weekday, I can take weekends off and still make the goal.